Cognita AV Outdoor Cinema - Cognita AV for Conference AV Support, Design, Hire & Equipment. 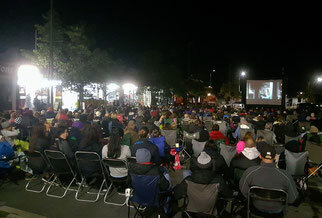 We look forward to working with you to bring the excitement of outdoor cinema to your location but please note; CognitaAV is a Nelson based company. We are happy to travel with the cinema but we do not dry hire the setup. Very funky and large 6m x 4m inflatable oudoor screen. Great for outdoor movies, weddings, trade displays, festivals and gatherings requiring high impact for large audiences. Our inflatable screen is often seen around the top of the South Island showing movies in public parks and reserves. We travel around the top of the South to provide screenings at many different venues. Available as screen projection only or with full stereo PA with replay system and microphone. This complete unit is available for one screening from $1,495+GST for within the Nelson Region including set up and pack down *. * This price does not include Copyright clearance for the movie to be screened nor generator for non-powered locations. If you are intending to show a licenced work in a public venue then it is important that you have sought authority to do so from the appropriate distibutor. CognitaAV can assist with this process. http://www.nzfact.co.nz/whatslegal.html to find out what NZ Law says and how to contact the various distributors. Copyright 2010-18 Cognita NZ Ltd.